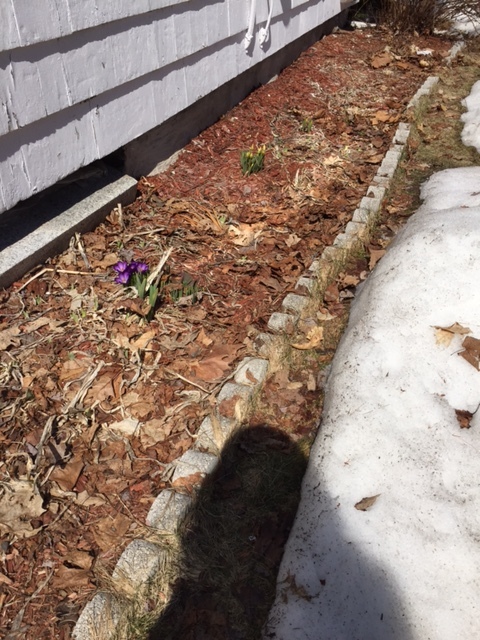 Here are some random thoughts and updates as I move towards spring. On Saturday spinning friends gathered at my house and as promised some big scary dangerous equipment came also. 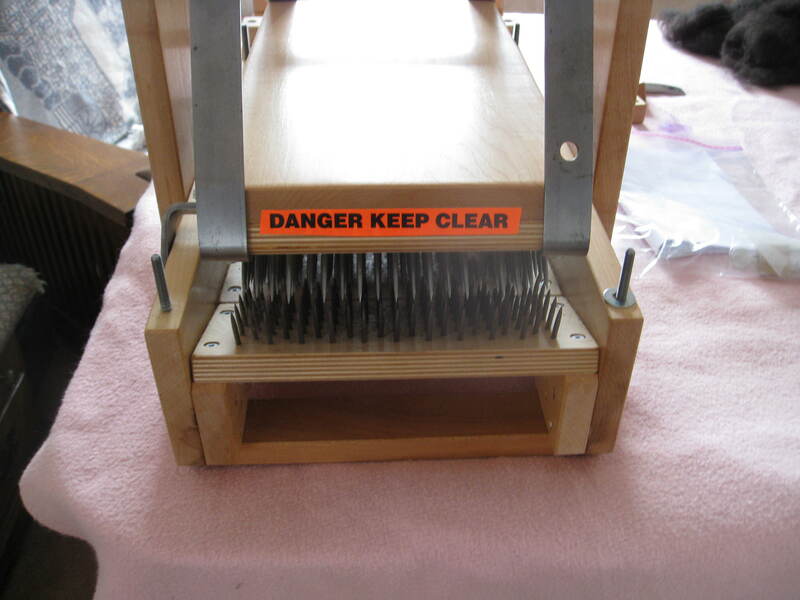 The picker is used to open fiber up for spinning and is the first step to getting rid of any short fibers and vegetation. 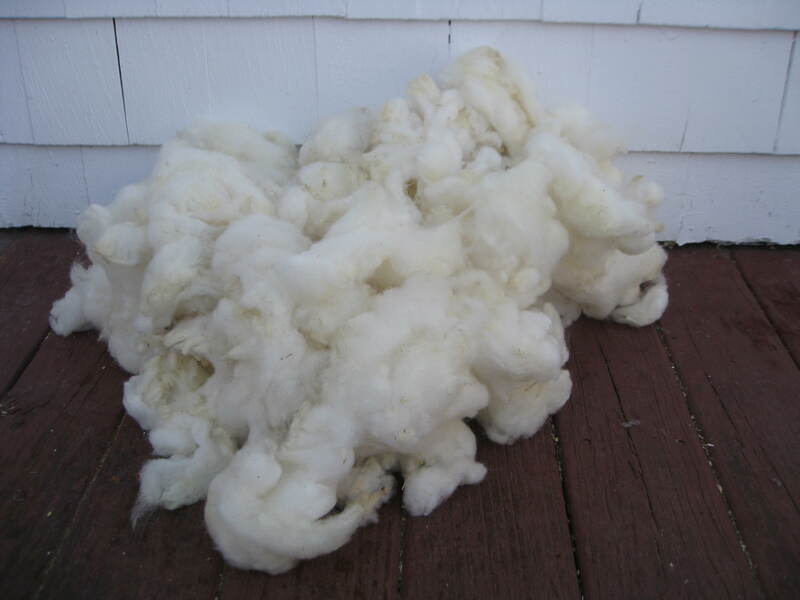 Short fibers can be the result of what are called second cuts when shearing. The path of the shearing blades is not always exact and they may have to go over an area again- like when a lawn is mowed and a small length remains on the side of the path-that results in some short fibers in the fleece. A few second cuts and some vegetation are not a problem and come out with processing. If I am choosing fleeces and there are a lot of short cuts and a lot of vegetation I pass it by since a lot of time would be needed to get them out and wouldn’t be worth it. I love the sign that comes with the picker. I feel so important because of it. Like I operate heavy construction machinery. Here is why it works so well, why we wear protective gloves and why I would never have it anywhere no matter how well guarded in a house with children. What a great feature it would make in a murder mystery. 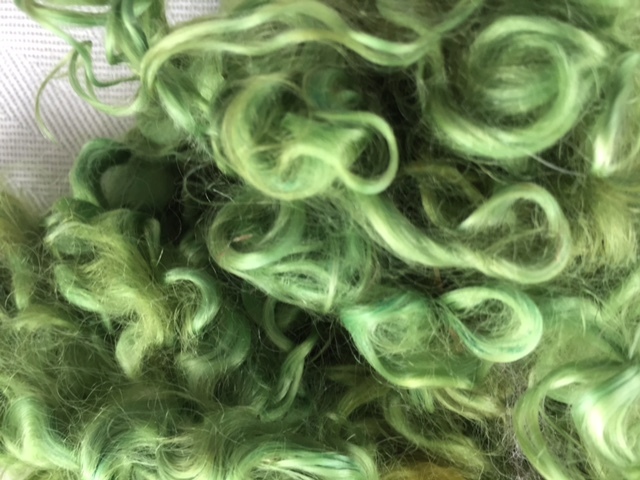 I have some beautiful Cotswold fiber I dyed green in it here. Truth be told I seemed to have felted it a bit so opened it up with the mighty picker jaws that I swing back and forth. 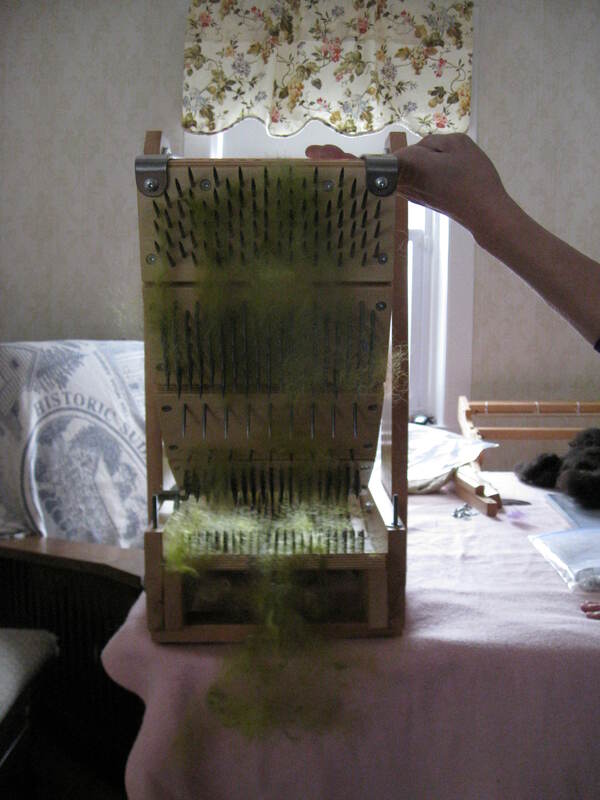 Now I will hand comb it to get out any end felted fibers that came off and will be able to use it good as new. Cotswold is a rare breed with long lustrous curly locks. Its shine, or sheen, remains when spun. Some day I will talk more about that breed since it is so beautiful. My last Gulf Coast fiber from my sheep of the month March is Fernando. Here is the picture I posted of him as unprocessed washed locks. He weighs 22 ounces. Not sure what I will do with him but he’ll be ready when I am. So, you know you are an out of control spinner when you were on an escalator yesterday at Logan airport and you see on the floor below tiles that create different Massachusetts scenes such as a runner in the Boston Marathon and you are delighted to see a spinner at an old walking spinning wheel pictured so you stop when you get to it and realize it is a fisherman at the wheel of an old sailing ship. Which you love too but not the same. Darn it. It is a scientific fact that every spinner who has a significant other be he or she called husband, boy friend, girl friend, partner has gone through an initial time when this person has tried to get the spinner to limit their fiber stashes, and failed. Supposedly reasonable comments such as “don’t you have enough” “what will you do with it” “where will you put it” are silently ignored and after a time they give up. It is bigger than they are. 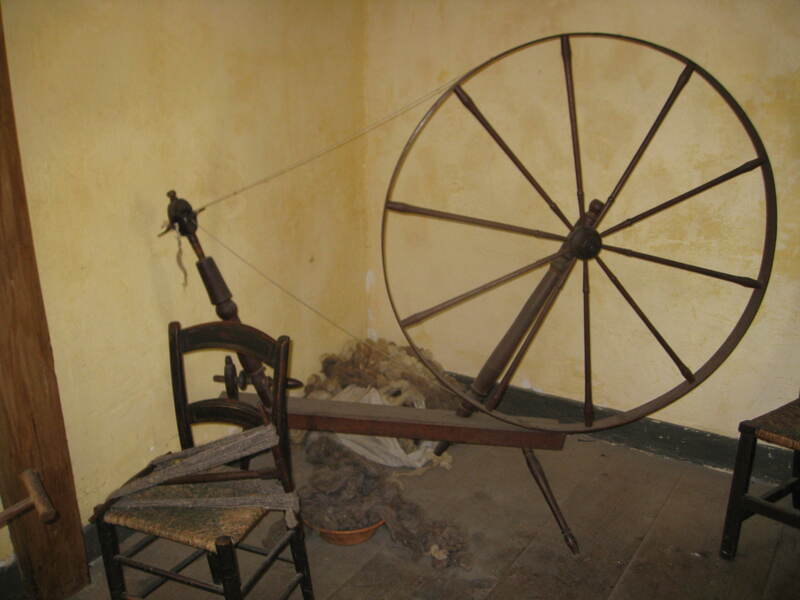 But here is a funny story about old time spinners in Iceland that I read in Bette Hochburg’s book Spin Span Spun. It says that after the men finished their work they would card wool for the women and someone would tell stories and lead the group in singing. I am sitting here enjoying the image of our partners engaging in that together. Especially singing. But I know they won’t go that far! I have been working my way through paper files that I have on fiber and fiber related information. I am happy to announce that I am done and since I like to weigh things I can say I have discarded and recycled 19 pounds of paper and files. Nineteen. Now my home files and my fiber files fit in one file cabinet drawer. Hurray! Can you get rid of some too?? It isn’t mandatory to weigh it, just dig in, do 5 a day like I did! This entry was posted in Uncategorized and tagged choosing a fleece, Cotswold sheep, crocuses, CT Sheep and Wool Festival, fiber prep, Gulf Coast sheep, Gulf Coast sheep fiber, handspinning, Icelandic spinners, New England, organizing papers, sheep, snow, Spring, weeding out clutter, wool picker, wool spinning on April 3, 2015 by Betsy Alspach. I have decided to focus this month on Gulf Coast Sheep rather than Bluefaced Leicester because of a pleasant ovine encounter that I had on Sunday. My husband and I visited the small but mighty Coggeshall Farm Museum in Bristol Rhode Island. 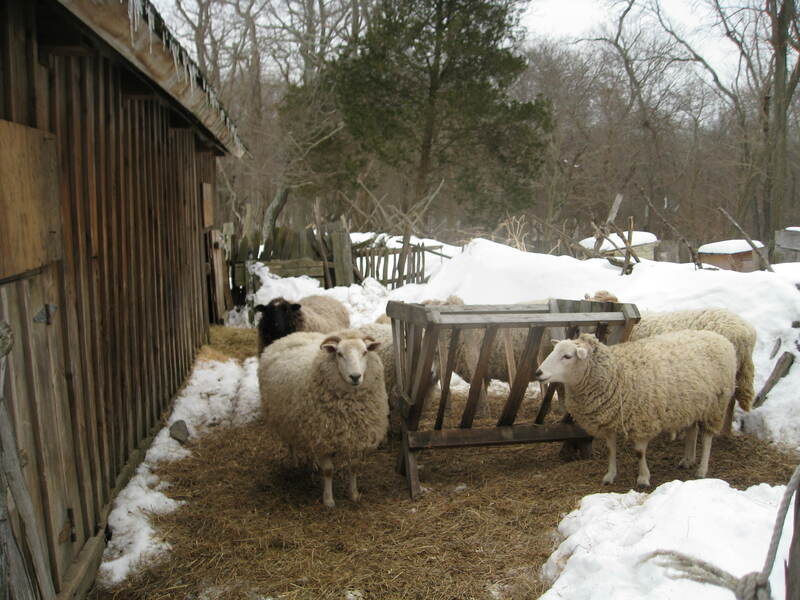 This living history museum is set in the year 1799 and depicts a small tenant farm. 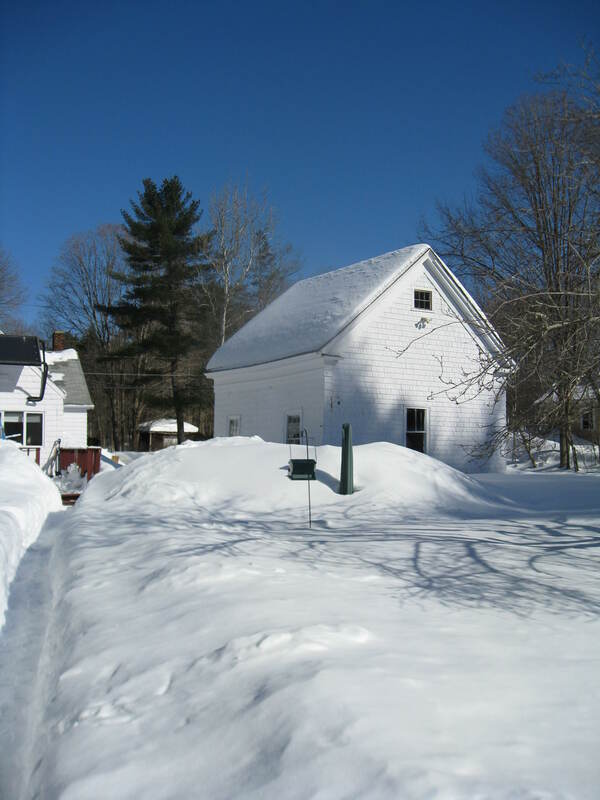 The house is the original house that was there and has furniture, period kitchen items, hearth cooking, and workshop activities that reflect the goings on in the lives of ordinary people of that time. We were there on a cold late morning when snow was about to arrive and had the three friendly and knowledgeable interpreters to ourselves. I was bundled up in my handspun hat, cowl and mittens and my LL Bean coat and was not cold at all. None of the animals were shivering either. We enjoy visiting house museums and those with barns are my favorites. My top interests are always wool spinning and any animals of course. This place has all of that and the animals and poultry are heritage breeds that would have been found on this farm in 1799. Here is a little of what I found in the house. Let me at them! But even better was who came out of the barn. Gulf Coast Sheep! One of my favorite breeds-let me at them! So as not to be neglectful I should add that the heritage chickens, turkeys and cows are also wonderful. This is a Devon cow which is a very old breed used for both milking and meat. For that fun reason of just having seen them I decided to change my fiber focus this month to the rare breed Gulf Coast Native Sheep. I’ll get back to the BFL later on for sure. Gulf Coast sheep ancestors were brought to the southeast of North America by French and Spanish explorers. Many were later abandoned, became feral and were able to survive on their own due to good foraging skills, toleration of heat and cold, resistance to parasites and resistance to foot rot. All are domesticated now yet they retain these hardy qualities, instinctively are good mothers and their wool and meat (yikes) can both be used. 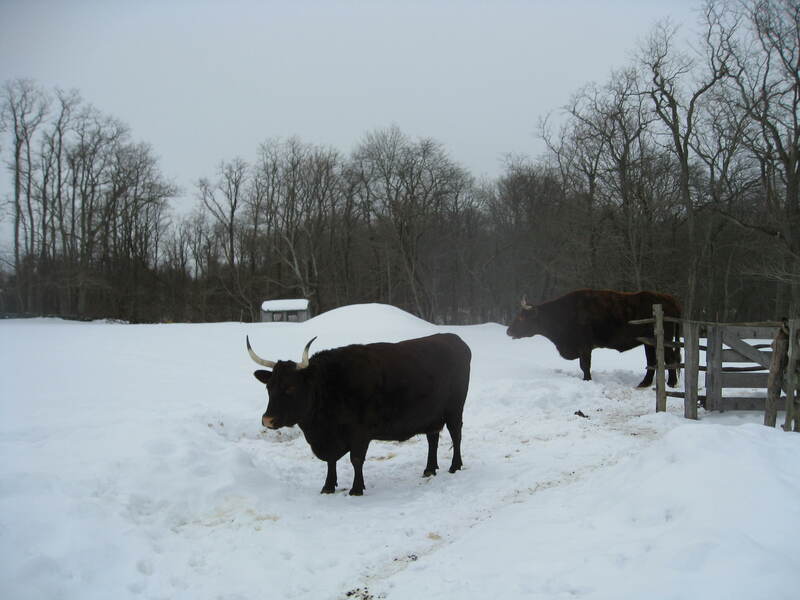 They are considered to be one of the few uniquely North American breeds and are not found elsewhere in the world. The breed’s wool staple length is 2.5” to 4” which means that is the length their fleeces grow in one year. 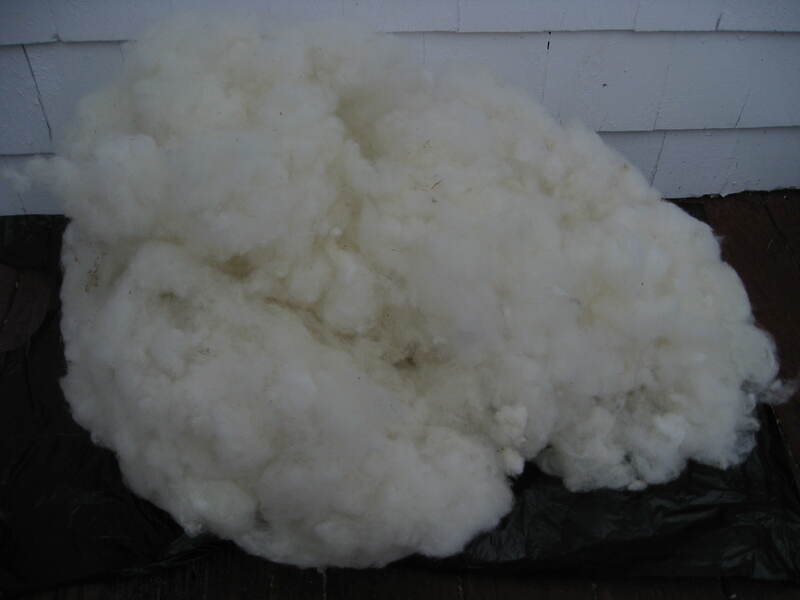 The micron count of the fleece, which refers to the diameter of individual fibers and determines softness/coarseness is 26-32 microns. Lower micron counts correspond with softest fleece. A count of 21 or below is often considered the range of fiber that will be comfortable next to the skin for most people although many can tolerate higher counts. I don’t know the micron count for my Gulf Coast fiber which comes from three unrelated sheep- Sophie, Fernando and Henna- however I subjectively think two would be on the lower and softer end and one is on the coarser. 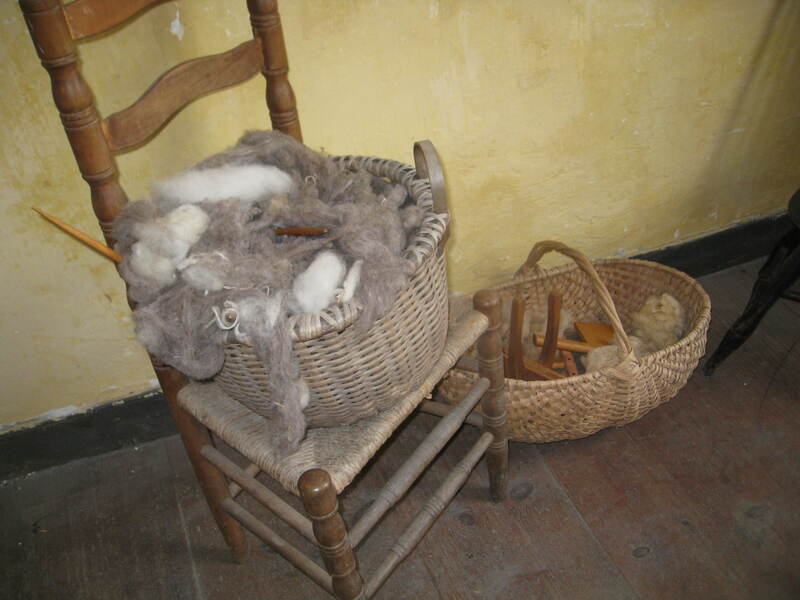 The softer wool can be used for mittens or outer socks and all the fiber can be used for many other items such as bags, or in weaving or rug hooking. It takes dye beautifully. Okay, enough history and facts for now although I myself can never get enough of either. Next post will show you my lovely Gulf Coast fiber and tell you where it came from and some of my plans for it. Even I don’t know what the plans are right now. Until then I would love to hear about others experiences with these fantastic sheep and their fiber! This is truly a rare breed that needs to be preserved both for its tenacious place in history and for its hardy qualities that make it an animal with fewer health needs than many. 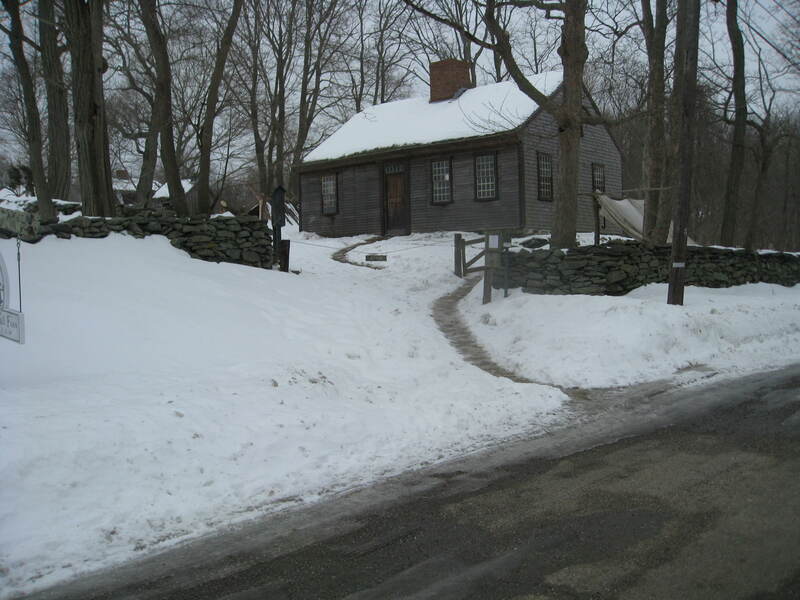 Coggeshall Farm Museum is definitely a place that deserves a visit and helps us at this time of year to remember the tenacity of the human spirit in the winter of 1799, and the winters that followed, as well! 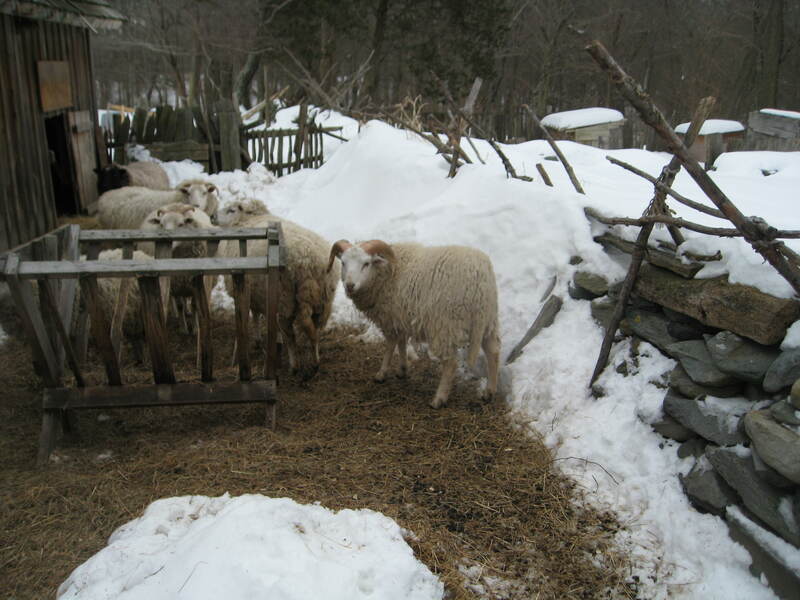 This entry was posted in Uncategorized and tagged Bristol Rhode Island, Coggeshall Farm Museum, Gulf Coast sheep, handspinning, heritage sheep breeds, living history museum, New England history, rare sheep, rare sheep breeds, Rhode Island, sheep, winter in New England, wool spinning on March 4, 2015 by Betsy Alspach. 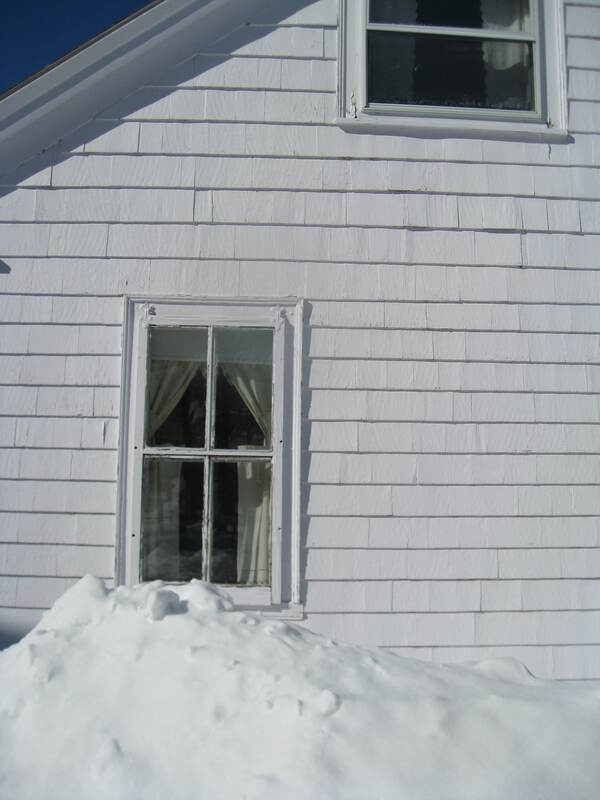 Snow on snow describes our New England landscape right now. Christina Rossetti wrote a poem, In the Bleak Midwinter, in the mid 1800s which became a Christmas hymn. It has a haunting melody and often goes through my head these days. But I don’t find winter to be bleak. It has such peacefulness to it and makes our homes cozy. My home was built in the 1830s and we also have a barn built then. Both built before she wrote her poem. 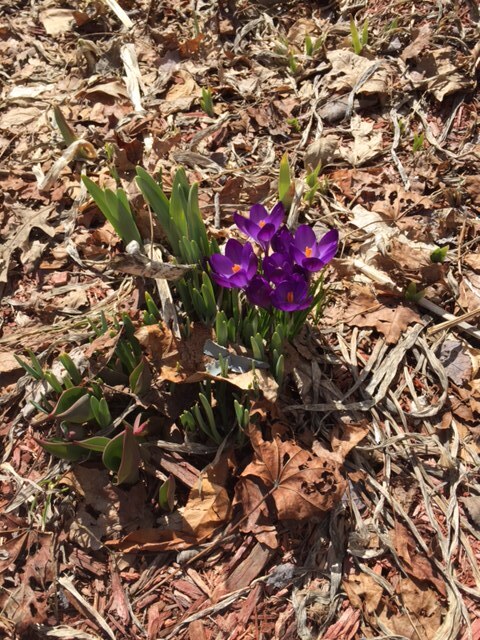 They are sturdy and with proper care have withstood many winters. I look around my backyard and think about all the people who have lived here and seen these sights. The colors in our scenery are mostly white snow, green pine trees, gray tree trunks and blue sky. There is a lot of glitter too as the sun makes the snow sparkle. 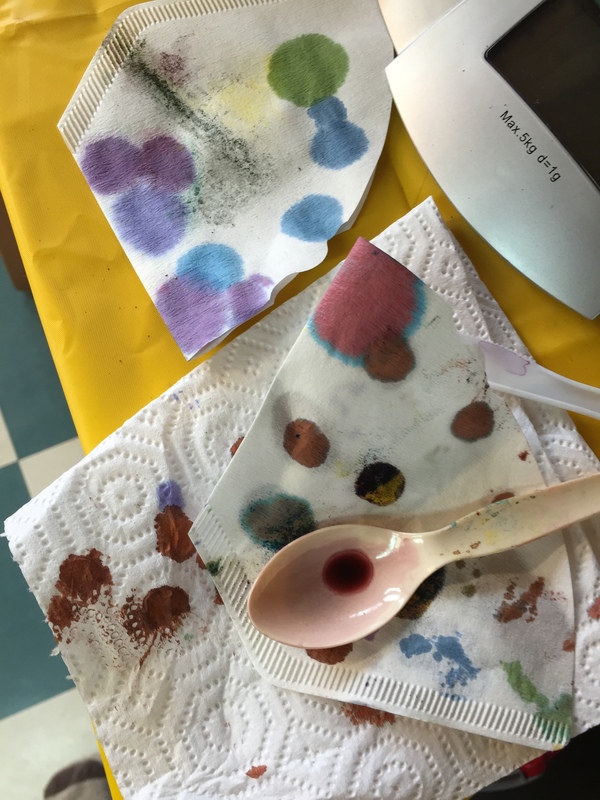 Having a dye day recently with friends helps to bring more colors into our lives. We gathered in a cozy kitchen, played around with color, ate black bean soup and chocolate, and as it does with women, our conversation at lunch skipped between laughter, teasing, reminiscing, sharing some sad/bittersweet personal situations, and talk of when we could get together again for more fiber activities, and more laughter. And now, what to do with these beautiful fibers? No spinning plans right away. I will just enjoy looking at them and touching them. That kind of attitude, common among spinners, has resulted in my recent fiber organizing that revealed that I had 500 ounces of washed fiber ready to process and spin. Wow. That’s a lot. I have used up some of them since then but not much. I’d like to think that I will use this blog as a vehicle that will give me accountability to use more up and not buy anymore in 2015. Yep, we’ll see how that goes. But I will give it the old college try and my next entry will include information about Bluefaced Leicester Sheep , the individual BFL sheep whose locks I have, and how I will use the 12 ounces I have. Each month I hope to do the same with other breeds. But for now I am off to pull out that fiber to enjoy its tiny curls and to think about how cute they are. That alone makes me happy and for a short while I will forget if we have snow on snow or spring flowers. 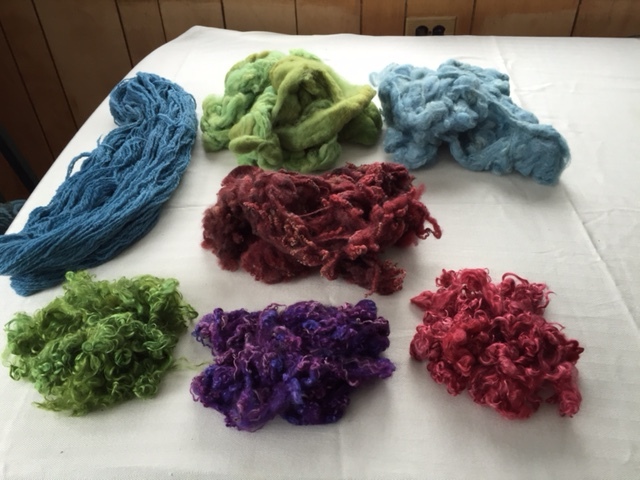 This entry was posted in Uncategorized and tagged colorful dyes, dyeing wool, handspinning, New England, old houses, sheep, snow, winter, wool spinning on February 27, 2015 by Betsy Alspach.